Stachys byzantina "Helene von Stein" .... it's so fuzzy! - Reportedly very tough. Tolerates full Southern sun or afternoon shade. - Definitely can handle wet weather as it made it through our very wet spring without any issues while sitting in amended clay soil. - Soft and fuzzy foliage! Among the most touchable foliage of any plant I've seen. Before mass production of consumer goods, people used plants for a variety of everyday purposes. As I understand it, Lamb's Ear leaves make a good bandage and can also be used as a natural 'toilet paper'. - The silvery color of the leaves is unusual and attractive in the garden. - Covers the ground thickly, shading out weeds, but seems to grow at a manageable, steady pace so that I feel I could control its spread if necessary. - Reportedly easy to propagate by division if I'd like to help it cover ground a little faster. - Not native to the Southeastern U.S. Stachys byzantina comes from the part of Southwest Asia now known as Turkey and Iran. 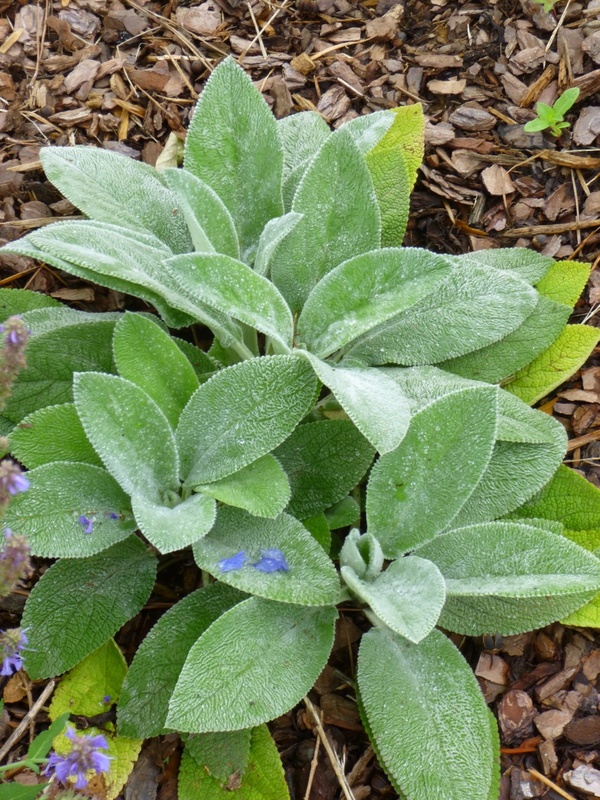 - Stachys byzantina is hardy to zone 4 and probably grows in a sort of dry and mountainous climate. As such, many varieties of S. byzantina reportedly struggle in Southern heat and humidity. Helene von Stein is supposed to be the humidity-defying exception to that rule. We'll see how it fares during the upcoming summer. - Many varieties of S. byzantina apparently send up flower spikes and then self-seed abundantly. But Helene von Stein rarely flowers, so this is less of an issue. - Helene von Stein is supposed to be herbaceous, but the leaves don't disappear over the winter, they reportedly turn into 'mush'. I'm not exactly sure what that means, but it doesn't sound all that attractive. On the other hand, the mushy leaves reportedly act as a natural mulch during the winter months and can then be easily raked away in the spring. (Or perhaps the plant will naturally send up new leaves to obscure the decaying ones, as happens with Sweet Woodruff and Pachysandra procumbens?) I'll have to see how this works out come the wintertime. - It's early days with this plant, but I'm optimistic. It would be great to have a bulletproof but not rampant groundcover for sunny spots and this plant looks like it might fit the bill. UPDATE - I ended up removing lamb's ear from the garden. It looked beautiful from spring to autumn, but just awful in the winter. The dead foliage was persistent, so that after a while, even the fresh new foliage was growing on a mound of dead and decaying gunk underneath. In addition to the cultivar, I got the straight species, which spread much faster and had lovely flowers with a long bloom season that attracted lots of bumble bees. Unfortunately, the flowers led to a plethora of seedlings in the immediate vicinity of the mother plant. If the old foliage decayed completely over the winter and/or if the plant didn't spread so quickly, I might have kept it. It's rock solid in the heat and didn't seem to have too many problems with our humidity. But I just couldn't deal with the old foliage and its spreading ways. Plus it's a non-native. Plus I didn't like the scent of the crushed foliage when I did try to clean it up at the end of the winter. Yuck. So... I had to give it the heave-ho.